Having recently come across this band, It was seen as the right thing to do in listening to the first two recordings to see where we are on the Evans The Death journey map. Well it has to be said, they have made their new album Vanilla, one to make you sit up and take notice. The 5-piece London Indie-Rockers fronted by Katherine Whitaker - Lead Vocalist/Keys, Dan Moss - Guitar, Olly Moss - Bass, Rob Mitson - Drums, and Matt Gill - Guitarist, present to us 10 songs with each song having it's own character. Talking of character, the album cover alone is possibly a talking point - a surreal hand drawn felt-tip pen sketch of two ugly middle-aged ogres. The phantasmical vehicle starter 'Haunted Wheelchair', has some glitch machine noises, dull guitar chiming, and a driving punk drum pattern by Rob leading off. When Katherine's vocals hurl in, they are full of rich soulful conviction and sound like an earnest dystopian battle cry. The song is multi layered and frantic, and has a slight middle break swing pattern; an icebreaker well executed. The B52's/Rolling Stones-ish rhythmic white punk-funk of 'Suitcase Jimmy', pairs raging punk energy with Red Hot Chilli Peppers funkateering. They have also added some jovial good-time boogie saxophone lines for good measure. An intro of guitar string scratching on 'No Imitations' leads into a seemingly more functional Indie-grunge groover. The vocals are distorted and have a Suede's Brett Anderson type wining to them, still, this is interesting combination plus the random machine noises appearing again. The fast paced breakbeat drum and guitar rhythms, coupled with current style harmonised melody lines, make 'Hey! Buddy' a grower, though the last hash-up into a clean to muffled driving beat sounds too planned. The bluesy sway of 'Cable St Blues' gives Katherine and the featured male vocalist - Not sure who that is, a Patsy Klein meets Joe Strummer virtual duet moment at what could be a time paradoxical New Years Eve party. It is as much bonkers as it is soulful - lots of driving guitars meets fumbling electric piano and burlesque horns. A moody lo-fi rocker with plenty of vocal prowess and instrumental hooks, has 'Disowner' showing hallmarks of a memorable song. The multiple guitar noise plus the down-to-earth lyrics creates the right amount of tense drama without sounding self-pitying, The 80's pop-funk bassline by Olly and harmonised intro has 'Hot Sauce' giving off an strong new romantic odour, with some avant-garde jazz saxophone squeals thrown in. The dreamy feel of short song 'Armchair Theatre' has many good hooks also, it's haunting shimmering guitar, plus horn section, is topped off with Katherine's heartfelt cries. The stoner swirling occuring on 'European Bison' grinds along and brings a wall of noise with it. The are short moments of popping up for air to go back in the foggy layered waters. The incessant post-rock screamfest really brings all to a head, and quite frankly it is a paranoia inducing hellish bad trip. 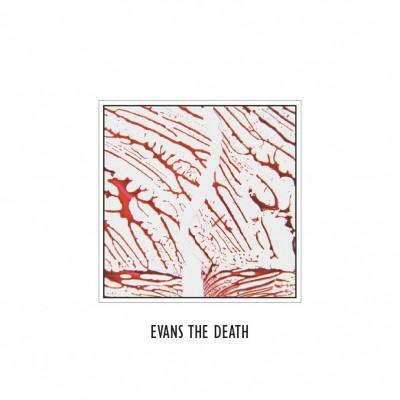 Vanilla is most likely, Evans The Death' s best work so far, it blows a lot of the current chaff filling our heads at the moment in UK music, out of the water. This really is an enticing experimental spectacle - to see live would be further rewarding.